The National Association of Hispanic Journalists is the leading organization for Latinos in the media. We are dedicated to the recognition and professional advancement of Hispanics in the news industry, plus excellence in coverage of the entire Latino community. Affiliation with an established and nationally recognized professional organization representing your interests within the news industry. Discounted registration rate to the Excellence in Journalism Conference - Sept. 5-7, 2019 in San Antonio, TX. A Six-Month Membership Extension - Active NAHJ members who have lost their jobs due to layoffs will be able to extend their membership by six months. This will allow access to the NAHJ career center and will continue their discounts on all of NAHJ's professional development opportunities. Access to NAHJ’s career center, a completely searchable career builder engine that allows members to browse current job listings. Use of NAHJ’s Résumé Referral Service through which member résumés are distributed to recruiters nationwide by NAHJ’s staff. Eligibility to submit entries to the NAHJ's Annual Journalism Awards at a discounted price. To organize and provide support for Hispanic Journalists. To encourage and support the study and practices of journalism and communications by Hispanics. To promote accurate and fair treatment of Hispanics by the news media. To further employment opportunities and career development for Hispanics in the news media. What originally started with 120 members burgeoned to 600 by the second year. Today, there are close to 2,500 members nationwide. NAHJ is an organization with deep regional roots and strong national presence. An active network has been created linking Hispanic journalists regionally and across the country. Programs and activities develop by the association are widely recognized as groundbreaking and tremendously effective for our colleges. 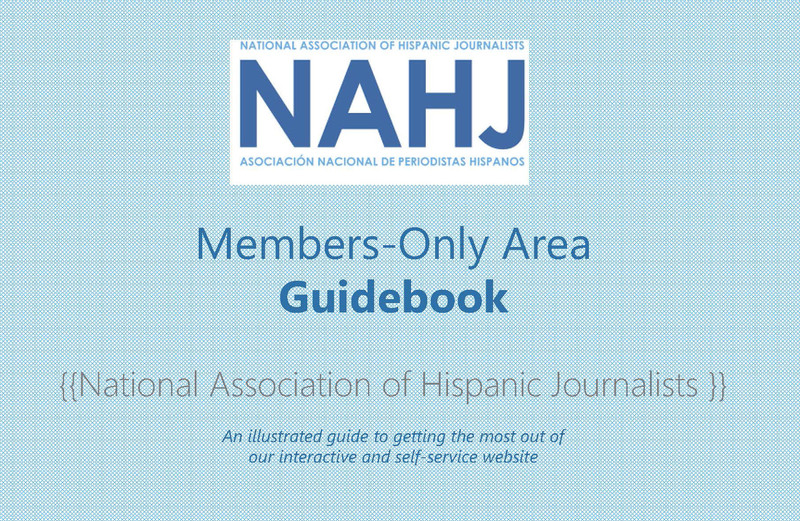 Most importantly, NAHJ is still growing, both in memberships and activities. NAHJ policies and projects are geared to foster the interest of Hispanics students in Journalism. By joining as a lifetime member, you will support NAHJ’s goals for years to come which include promoting fair treatment of Hispanics in the news media. As lifetime member of NAHJ you will receive special recognition in NAHJ literature and at convention special events. In addition, with your life-long pledge, you will no longer have to renew annually. Persons whose principal means of support is earned in the gathering, editing, or presentation of news. Includes public affairs for media companies. Regular members may not be employees of government-supported news organizations. Regular members may vote and hold office. Persons who are educators of journalism in institutions of higher learning. Academic members may vote but not hold office. Persons who are not journalists but are employed in such media-related fields as public relations, public or corporate information, directors of media organizations, etc. Associate members may not vote nor hold office. Persons engaged in full-time study in a recognized educational institution of higher learning. Student members may only vote for and hold the office of student representative. Requires proof of student status. Check out our new Career Center!! Students: Scholarships open this December! Stay Tuned. © Copyright 2018 NAHJ. All rights reserved.